Last Thursday, our VOICEs team held a “Women in Tech” Panel to discuss opportunity and diversity in a male-dominated workplace. 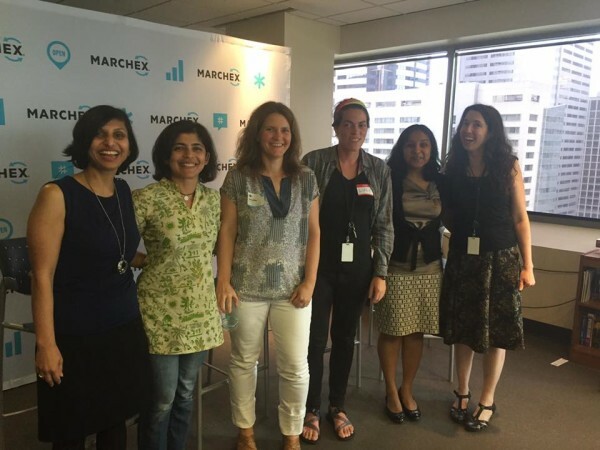 Manisha Power, Jennifer Beckmann, Lucy Williams, and Vibha Rathi came from near and far to give our VOICEs group insight into their daily lives, what drives them in their career, and provided a few tips on overcoming diversity gaps that some may still face today. 1) Having an unconditional love for all things math and science her entire life. 2) The gratification of being a part of something that is forever improving and changing. 3) Working with some of the world’s smartest people and the the opportunity to always be challenged. Lucy, who is currently the only woman Data Scientist for Marchex, followed with stating her satisfaction comes from knowing she’s personally affecting products that people she knows use today and every day. This rolled perfectly into the second question – what: What do you bring to the table, and what has been your proudest professional moment thus far? Jennifer, who is a Principal Program Manager for the Experimentation platform (ExP) team at Microsoft, said her proudest moment was her first successful AB test in-office where the code base being used was outdated. A strength she called out is her ability to connect with her developers, and provide a unique sense of comfort in the workplace. This resonated with many in the forum. However, she finished her statement by saying although there are narrow-minded people everywhere, most people out there want to give you a chance, to give you guidance, to give you a shot. Vibha, who is currently a Senior Software Engineer at Facebook, spoke further on this, stating that another barrier that women tend to suffer from more so than men is “Imposter Syndrome”. This is when we feel we are undeserving of the responsibilities and opportunities we are given in our roles because we think we lack the qualifications. She followed with saying the only diversity problem she faces today is lack of female role models. So, what can we do to help? Lucy said she tries to validate women around her at any chance she can – that highlighting the success of women is such an easy step people can start taking now. Vibha followed with the importance of knowing no one is actually standing in the way of your success, and furthermore, we need to be explicit in backing one another up. The Panel wrapped up with one final segment. Each woman provided one last important note that they would pass along to their younger selves? Manisha: “Simply – Yes you can!